Noureddin Zarrinkelk [in person], father of animation in Iran, is a renowned Iranian animator, concept artist, editor, graphic designer, illustrator, layout artist, photographer, script writer and sculptor, born in 1937 in Mashhad, Iran. He studied pharmacy at Tehran University and holds a PharmD. Then he studied animation film in the Belgium Royal Academy of Fine Arts (Raoul Servais) from 1969 till 1972. Zarrinkelk founded the first school of Animation, which later merged with the prestigious faculty of fine art of Tehran University. He continued being a professor of animation and graphic arts well into his retirement age, and became the president of ASIFA (Association International du Film d’Animation) by his peers in 2003. 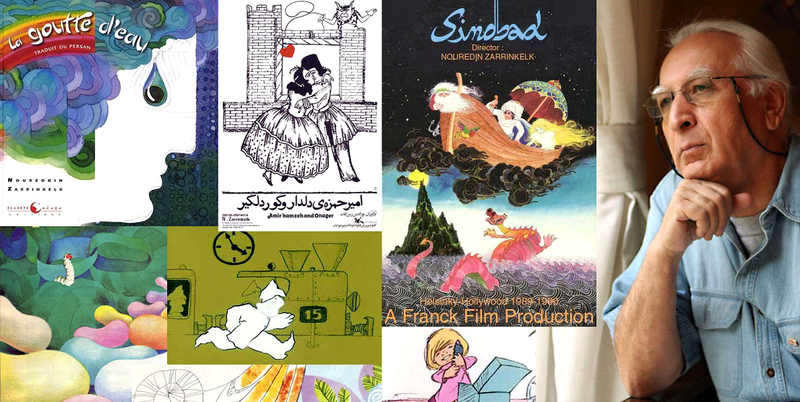 Iran’s animation owes largely to Noureddin Zarrinkelk. He was instrumental in founding the Institute for Intellectual Development of Children and Young Adults (IIDCYA) in Tehran in collaboration with the late father of Iranian graphics Morteza Momayez and other fellow artists like Farshid Mesghali, Ali Akbar Sadeghi and Arapik Baghdasarian, among others. Since 1971, he has been Jury member of various international animation festivals and illustration biennials. A selection of films by Mr. Zarrinkelk will be shown: Bani Adam, Duty First, One Two Three, A Playground for Babousch, Mad Mad Mad World. Sponsored By: ZKCO Zarrinkelk, Kashefipour & Co.
Filmography: In the U.N.; Writer, Designer & Director (Under Production) Pood; Writer, Designer & Director 2000 Identity (For UNICEF); Writer, Designer & Director 1999 Moscow; (Mouse & Cow) Writer, Designer & Director 1998 Sinbad; (Full length animated feature) Stylist, Director 1987-1991 (Hollywood) Super Powers; Writer, Designer & Director 1982 A Way To Neighbor; Writer, Designer & Director 1978 Prince Amir-Hamzeh; Writer, Designer & Director 1977 The Mad, Mad, Mad World; Writer, Designer & Director 1975 Atal-Matal; Writer, Designer & Director 1974 Association Of Ideas; Writer, Designer & Director 1973 Philipo and a Train from Hong Kong; Director 1971 (Belgium) A Playground for Baboush; Writer, Designer & Director 1971 (Belgium) Duty, First; Designer & Director 1970 (Belgium).